Custom domains used for marketing purposes (i.e ‘vanity URLs’) are a powerful way to boost your branding. However, choosing one is not always a simple process. Ultimately, a poor vanity URL won’t reflect well on your brand, and will likely stymie your business’ growth. Fortunately, there are a number of best practices you can follow that may serve to maximize the effectiveness and fit of your vanity URL. Choosing one is more to do with common sense and logic rather than creativity. In this article, we’re firstly going to discuss what a vanity URL is, then walk you through the steps you need to choose and purchase one. Finally, we’ll offer some advice about integrating it into your marketing strategy. Simply put, a vanity URL is a custom domain for a specific page on your website that’s been branded for marketing purposes. For example, if you’d like to offer users an easy way to your online store, you could go with mywebsitestore.com rather than let users navigate to store.mywebsite.com. Using vanity URLs offers a number of benefits. Firstly, aside from creating a memorable handle to help users get back to a particular page on your site, they also strengthen your branding efforts by enhancing your business’ credibility. Also, vanity URLs provide the potential for custom-branded business email addresses, which helps to strengthen your professionalism. In addition, vanity URLs can directly lead to increased traffic. This is because having your custom domain name on display in search engine results and ads enhances Click-Through Rates (CTR), potentially bringing more business to your site. Make it memorable. Catchy, short URLs help readers remember how to navigate to your site the next time they want to visit. Make it pronounceable. Memorable and pronounceable often go hand in hand, and a ‘natural-sounding’ URL can aid retention. Avoid potential infringements. Simply put, you don’t want to end up in court. Take caution, and make sure you’re not treading on the toes of another company with your vanity URL. All in all, choosing a vanity URL isn’t a ‘dark art’. By using some common sense and thinking about the bigger picture, you’ll be well placed to think about making a purchase. Now we’ve discussed some pointers for choosing a vanity URL, let’s look at how to actually select and purchase your new custom domain. Shopify’s Business Name Generator. 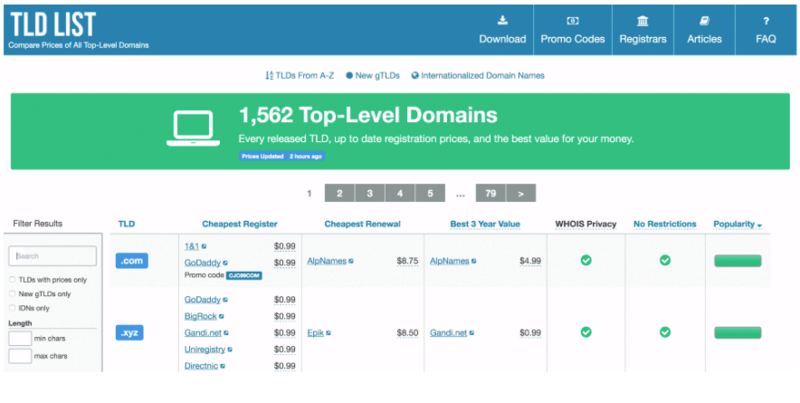 This tool will generate available domain names based on the keywords you enter. You can then choose to reserve your branded address directly through Shopify. BustAName. 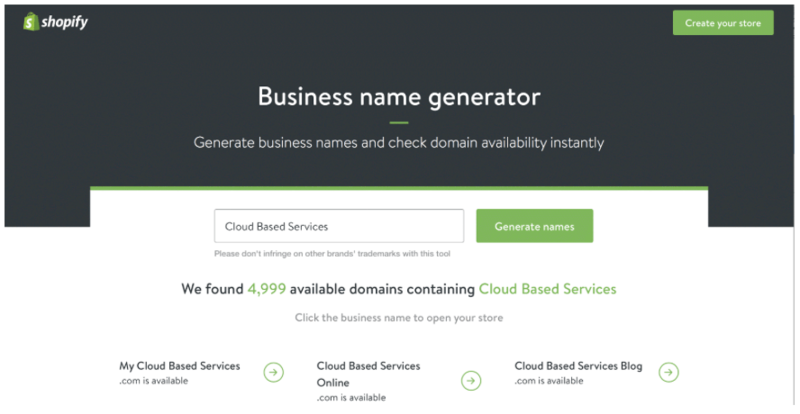 This works much like Shopify’s Business Name Generator, offering a word combiner that assists in selecting the perfect domain in addition to a quick domain check. Once you have a suitable domain name, it’s time to shop for the best price. Of course, different domain registrars offer different prices. Sometimes the same vanity URL will go for a lower price at a different registrar, so it’s always best to shop around regardless of your budgetary concerns. This step will require some mucking in to find the best price, but the savings you’ll make will ultimately outweigh any time you’ve spent researching. The final step is to make your purchase. If your budget isn’t a concern, or you’re simply looking for a recommendation, we’d suggest either NameCheap or GoDaddy. Both are stellar registrars, with a range of available Top-Level Domains (TLDs) on hand. Purchasing your chosen domain will likely be the easiest part of the process. Essentially, if you have your payment details, and if you’re used to the online purchasing process, you can buy a domain! Now you have a vanity URL in hand, you can begin to consider your marketing. When it comes to integrating vanity URLs into your marketing strategy, they’re essentially useful when honing in on certain aspects of your business you’d like to promote. For example, take a food company (ACME Food) that offers among other services, a seated cafe. Normally, you would create subdomains or folders for each (for example, acmefood.com/cafe). However, purchasing a vanity URL such as acmecafe.com enables you to offer branded email addresses, as well as something that can be added to flyers, business cards, and social media. You can also do the same for your different locations or branches. For example, you have two establishments both uptown and downtown. Rather than direct visitors to acmecafe.com/uptown, you can offer acmecafeuptown.com. You’ll also be adhering to Search Engine Optimization (SEO) best practices too, which is a bonus. Automated page and post short link creation. Server-side 301 permanent redirects (essential for implementing vanity URLs). Click tracking and related analytics. It’s an easy to use plugin that can help you implement your vanity URLs correctly, with no impact to your SEO, and enhance the work you’ll have done to implement a strategy. It’s a fallacy that choosing a domain name is a simple aspect of establishing your business’ online identity. However, choosing a poor vanity URL could inhibit your product and/or company’s growth. Choose a suitable, well-considered name. Carry out a price comparison by shopping around. Choose and purchase vanity URLs using preferred domain registrars. You can also leverage the power of Pretty Links to enjoy a host of marketing benefits while still retaining your custom, branded vanity URL. Do you have any questions about choosing a vanity URL? Let us know in the comments section below! What Is the Optimal Length for Your Blog Posts?